Welcome to ProctELKU Specimen Database Based on the Parasitic Wasp Collection Preserved in the Entomological Laboratory, Kyushu University ! 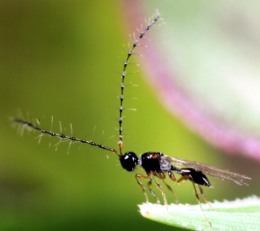 A database ProctELKU is a specimen database based on the parasitic wasp collection preserved in the Entomological Laboratoty, Kyushu University. Prof. Keizo Yasumatsu of the Entomological Laboratory of Kyushu University succeeded in the biological control using Anicetus beneficus for the first time. We accumulated many specimens of parasitic wasps in the laboratory. The number of the specimens belonging to the Proctotrupoidea which were identified at genus level is 7,689 in total at present (August 31, 2011). Each record is consists of 19 items according to a format of the Darwin Core of the Global Biodiversity Information Facility(GBIF), such as scientific name, country, collecting locality, collecting date, collector, etc. The ProctELKU is managed by a text database management system SIGMA. The ProctELKU file is supported by a Grant-in-Aid for Publication of Scientific Research Results (Head Investigator: Osamu Tadauchi) from the Japan Society for the Promotion of Science. Scientific Name Gryon yamagishii sp. n.
Entomology Database Project Group (Head: O. Tadauchi, Editors: O. Tadauchi, K. Yamagishi, Y. Konishi, M. Uchino, System administrator: H. Inoue,F. Kamitomo) holds the copyright on the entomology database ProctELKU. Inquiries and Comments about ProctELKU Should be the Following E-mail Address.